The science of Environment Studies is a multi-disciplinary science because it comprises various branches of studies like Chemistry, Physics, Medical science, Life science, Agriculture, Public health, Sanitary engineering etc. It is the science of physical phenomena in the environment. It studies of the sources, reactions, transport, effect and fate of physical and biological species in the air, water and soil and the effect of human activity upon these. Following are the objectives of this undergraduate program course. The overall aim is to prepare students for career and profession in the field of environmental science, policy and management and to strive for continuing professional development and learn to overcome constraints. To improve country’s environment at all levels through availability of trained manpower in environmental science, policy and management. For managing and maintenance of forests which are natural resources and for the maintenance of wildlife forms task under natural resource conservation. It is also a scope of environmental studies. With the knowledge of environmental science everybody can control the pollution. He/she can handle the waste management and also look for ways to control pollution on the aspect of pollution control. There are several independent environmental consultants who are working with nationally. They offer advice to solve the problems of environment the optimum solution for the upcoming problems. They give direction for controlling pollution due to industrial development. Environmental scientists work towards maintenance of ecological balance. They also work towards conservation of biodiversity and regulation of natural resources as well as on preservation of natural resources. Most of the industries have a separate environmental research and development section. These sections govern the impact that their industry has on the environment. Our environment is being degraded by the rapid industrialization. To combat this menace there is a growing trend towards manufacture of "green" goods and products. 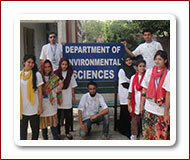 So we can say that there is a good scope in the field of industry from environmental studies. Research and development has tremendous scope due to increasing public awareness regarding the environment. Due to an increasing threat from global warming, many steps are being undertaken for the reduction of greenhouse gases and the adoption of renewable energy resources. It generates awareness now regarding the use of solar energy for variety of purposes. Many NGOs (non-governmental organizations) help in creating awareness regarding the protection of the environment and making the masses aware of various environmental issues. They also generate a public opinion in this field. They work towards disseminating information and in bringing about changes in political policies that are personally effect the environment.